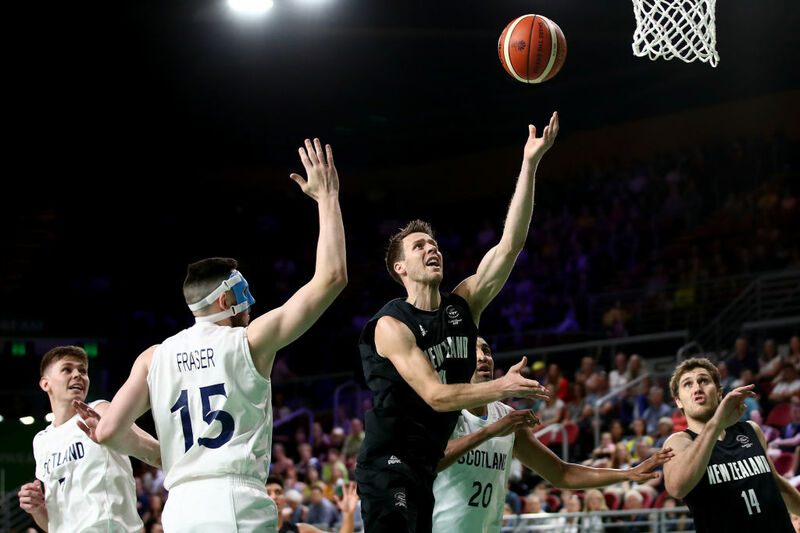 The Tall Blacks have overcome the disappointment of their last-gasp loss to Canada to get up - earlier than normal - and beat Scotland for Commonwealth Games bronze. Led by Thomas Abercrombie's stand-out game-high 26 points, New Zealand ran out 79-69 winners at the Gold Coast Convention Centre on Sunday morning. The early start time of 9am may have caught the Kiwis drowsy and flat as Scotland took a 21-19 lead after the first quarter. However, late in the second quarter the New Zealanders started hitting more three-pointers - Abercrombie sank six from nine - and finding space under the basket and they led 41-35 at half-time. Scotland had a miserable morning with their three-pointers (five from 25) but were still in touch after the break, backed by a lone voice chanting "deep-fried Mars bars, deep fried Mars bars". However, the New Zealanders slowly pulled away during the post-break spell to take a 15-point lead into the final quarter. The gap was too big for Scotland to pull back and the Kiwis claimed the bronze medal by the 10-point margin. "It was always going to be a tough one to get up for this early in the morning," Abercrombie said, admitting he probably hadn't played at a similar hour since primary school. "It takes a while to get the legs going ... we never quite found our rhythm. "At times our defensive pressure was really good, we forced them into some tough shots. At times we gave up some really easy ones." Coach Paul Henare said it was also tough for his players to turn around just 20 hours after their 88-86 loss to Canada - beaten by a three-pointer right on full time. "It was a really disappointed and flat group last night. We knew it was going to be a bit of a grind," he told NZ Newswire. The Tall Blacks had tried to adapt their week to get used to the early starts - not many were used to playing at 9am, Henare said. "For training maybe but not for games." However, he said the players would celebrate their opportunity on the podium. "There's not many people in the world who get to do that so it's important that they enjoy this moment. "Obviously we are not as high on the podium as we would have liked but we are on the podium all the same." Canada will play Australia for the gold medal later on Sunday.